Plant filters, a beautiful bonus for your koi pond. A plant filter (PF) is not a koi pond filter in itself, it is a bonus to the "normal" filter. Of course one that is beautiful to see! A well constructed PF takes nitrates and other substances from the water that are not removed by your main filter. You can reduce nitrate levels by water changes but to get the nitrate value really as low as possible, you can also use a PF. In addition, daphnids thrive in a PF when added so you'll have virtually no green water by algae. (This also has the disadvantage that it's near impossible to get the water green again when desired so). A PF can not get too large, they are almost always to small, to me a gully of 20cm wide does not help. Simply, the more plants, the more waste that can be extracted. A PF can be build exactly like the main koi pond and with the same materials (AND BOTTOM DRAIN / drain of 63mm at least!). Usually, it is after the construction of the main pond and filter that people think about the addition of a PF. Usually a narrow shallow trough behind the pond is made,fed by a small pump and 3 or 4 plants crammed inside. This will surely help at least 0.0001% but actually it is purely nice to see, not helping a lot. So think about the size and position and integration of the PF simultaneously with the construction of the whole koi pond. A good PF does not need to be deeper than 100cm but has the largest possible surface area. The trick is to select and put the most widest range of (different) plants as possible in the PF. The easiest way to work is with grit and baskets containing the plants that will do the job. Approximately half of your PF should be filled with (different) oxygen plants and the other half with different riparian / wetland plants. The oxygen plants are placed in the deaper area, the top of the baskets in which they come are at least 20cm below the surface. Depending on the plant type of up to 80cm. So that is one half of your PF. In the other half, there are riparian or wetland plants with the top of the baskets about 5 cm below the water surface. I find it the easiest to put grills to under these baskets around 20 cm above the bottom. In this empty space dirt will settle down, the roots grow well and quickly take waste out of the water. These grids can be easily placed on a lower extra brick wall that is made during construction. The liner makes 1 extra bend and your ready. No complicated tanks or buckets upside down etcetera. It is a myth that water can flow too quickly through the PF. As long as the plants remain in their place and not drift away your good. The wastes are removed from the water terribly quickly, just like in your main filter by the way. So the size of the pump that supplies water to your PF is optional. Usually a waterfall is chosen as the outlet to the pond which is naturally beautiful and inriches the pond with very much oxygen. So choose a pump so that the waterfall is beautifull. The PF can be fed directly from the pond, but also from the main filter or skimmer or whatever. It is important that you can turn of the PF and thus the waterfall when you want. During treatment of the pond or during the winter (waterfall cools the pond water strongly!) you can simply turn off the PF and the koi pond is still purified through your main filter. (Many different treatments also kill daphnia, but do not turn on the PFfor 2 weeks after a treatment or you could immediately introduce "fresh" parasites from your PF in your koi pond. A bottom drain and light angle of the bottom are neccessary to regularly rinse the bottom from settled debris and to prevent bacteria or parasite problems As with any pond the shape is important to prevent water corners that stand still. There are hundreds of beautiful different water plants, and the first is even less useful as the next...nice to see they hardly grow and thus do not purify a lot. I't is obvious that these are not the plants youd would want for a PF filter as addition to a koi pond. Fortunately there are many that grow very fast, and they are perfect! Growing fast comes with using lots of nutrients. 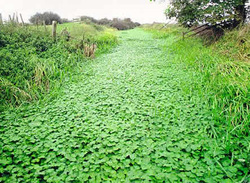 Water pennywort, a disaster in the ditch but perfect as a plant filter. I am convinced that it's best to use plants from each catagorie, and the more the better. The maintenance of a well build PF is simple. Regularly rinse like your main filter so no dirt is collected on the bottom. And regularly harvesting / pruning. In the spring, all plants will grow significantly, make sure that dead plant parts are removed. Towards summer most plants will show significant growth, the advantage of the fastest growers is that you can just rip off the excess and throw in the bin. Yellow Iris (and calamus) I prune back to the surface after flowering and again in late October. Around this time I also take the baskets out 1 by 1, prune away everything around the baskets and sometimes half of the contend of each basket. It will grow a bit the rest of the year so new roots are ready next spring. In the winter I close of the PF from the main koi pond because of the cooling that is caused by the waterfall. If there is ice I cut everything above the ice cause its dead anyway. So all in all regularly flush the bottom drain, what you should do anyway, and 3 times a year for an hour pruning, Seems like not much extra work?